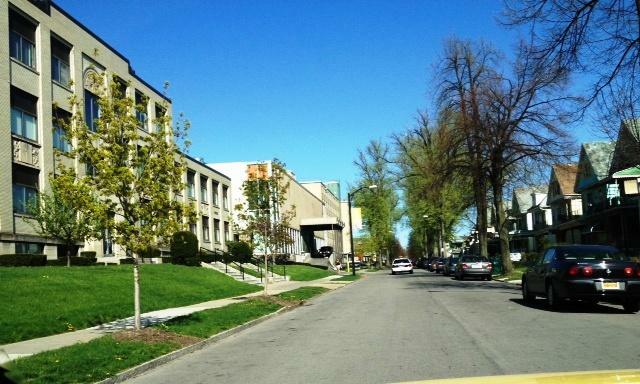 Canisius College in Buffalo has suspended students involved in an incident of a black baby doll found on campus earlier this week. Outside Canisius College in Buffalo. College President John Hurley issued a campus community statement saying those involved have been suspended pending a disciplinary decisions. He said appropriate discipline would be taken that could include removal from the school. 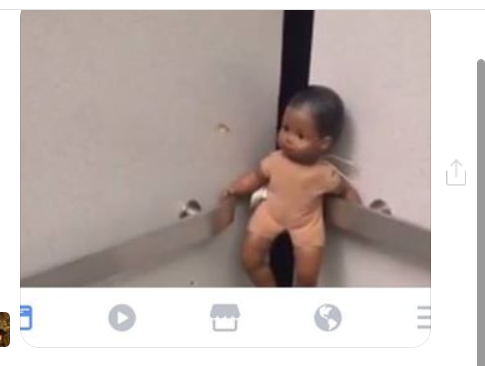 The black baby doll in the elevator from a Facebook post Tuesday. “The events that occurred in a Frisch Hall room later that evening are far more disturbing. At some point in the evening a student took the doll out of the elevator and to a residence hall room where the doll was hung from the curtain rod in the room and participants took photos of it. One student created a meme with language about “Trump fans” and sent it to friends. It was soon posted on social media where it was seen by a number of students, some of whom called it to the attention of Public Safety which immediately started an investigation into how this happened and who was responsible. It’s evident that what may have started as a thoughtless, insensitive prank earlier in the evening in the elevator degraded into a very offensive, inappropriate act later that night,” Hurley stated. Hurley, however, explained campus public safety conducted an investigation finding two separate incidents involving “two unrelated sets of students”. “The doll in question was apparently left in a Frisch Hall laundry room by a young visitor to the campus on Tuesday. At about 5:20 p.m. on Tuesday, some students saw the doll on a chair and put it in the Frisch elevator, reportedly as a prank to startle people when the elevator door opened. The doll appears in photos in the elevator and propped against and/or behind the railing along the wall of the elevator as it was repeatedly moved and repositioned over the next 90 minutes or so as people came in and out of the elevator,” wrote Hurley. “We have discovered no evidence -- in either the photo(s) that circulated on social media or in any other video of the interior of the elevator that night – that the doll was ever hung in the elevator or had a noose on its neck. Nonetheless, the placement of the doll in the elevator by itself is problematic, principally because of the chain of events it set off on a night when the results of the presidential election had many students feeling distressed and vulnerable,” stated Hurley. The incident sparked a great deal of concern of racism. Some consider it a hate crime. Gerrell Lanos is a Canisius senior. Lanos told us Wednesday he considers it a hate crime. "It is a little discouraging that they aren’t labeling this as a ‘hate crime’ because in my view, I do see it as a hate crime,” Lanos said. Hurley said they are in the process of retaining an outside investigator to review results of their investigation. “To provide us with advice on whether additional steps should be taken with law enforcement agencies with respect to possible hate crimes. The investigator will be experienced in these kinds of investigations and in applicable federal and state laws. The investigator will be given free rein to look at all of the college’s records, videos, summaries of interviews and any other items that he may deem necessary. He will have access to witnesses if necessary. We will be guided by this review and I will communicate the results of the work as soon as they are available to us,” noted Hurley. I want to follow up to my letter to the campus that I sent yesterday (Nov. 9) in the wake of the disturbing incident in Frisch Hall involving the black baby doll. More than 300 students, faculty and staff attended an open session in the Student Center yesterday afternoon so that students could express their opinions and feelings about the incident. About 15 students took the microphone to talk about the incident and their feelings about the race climate in the Canisius community and how it needs to be more strongly addressed. It was emotional and heartfelt and I want to assure our students that your college has heard you loud and clear. It is clear to me that this episode has exposed some deeply-held concerns among our students of color and that we need to go well beyond addressing the immediate incident involving the doll. With respect to the doll incident, our Public Safety department has worked diligently since Tuesday evening to get to the bottom of this matter and I am very grateful for their prompt and thorough work on the case. I received their report this morning. There were two separate incidents involving two unrelated sets of students: the placement of the doll in the elevator originally, and the use of the doll in a residence hall room that resulted in a photograph of the doll hanging from a curtain rod. The doll in question was apparently left in a Frisch Hall laundry room by a young visitor to the campus on Tuesday. At about 5:20 p.m. on Tuesday, some students saw the doll on a chair and put it in the Frisch elevator, reportedly as a prank to startle people when the elevator door opened. The doll appears in photos in the elevator and propped against and/or behind the railing along the wall of the elevator as it was repeatedly moved and repositioned over the next 90 minutes or so as people came in and out of the elevator. There are two strings at the doll’s neck that are part of the doll’s construction; e.g. its head is attached to the body by the string. We have discovered no evidence -- in either the photo(s) that circulated on social media or in any other video of the interior of the elevator that night – that the doll was ever hung in the elevator or had a noose on its neck. Nonetheless, the placement of the doll in the elevator by itself is problematic, principally because of the chain of events it set off on a night when the results of the presidential election had many students feeling distressed and vulnerable. For these reasons, the students involved in this portion of the incident will be subject to the disciplinary process under the Community Standards. The events that occurred in a Frisch Hall room later that evening are far more disturbing. At some point in the evening a student took the doll out of the elevator and to a residence hall room where the doll was hung from the curtain rod in the room and participants took photos of it. One student created a meme with language about “Trump fans” and sent it to friends. It was soon posted on social media where it was seen by a number of students, some of whom called it to the attention of Public Safety which immediately started an investigation into how this happened and who was responsible. It’s evident that what may have started as a thoughtless, insensitive prank earlier in the evening in the elevator degraded into a very offensive, inappropriate act later that night. This entire episode is very troubling for several reasons, not the least of which is the pain that it inflicted on so many in our Canisius community. While there was some discussion at yesterday’s open session about the intent of the students involved, I want to stress that in one sense, intent is largely irrelevant. The acts occurred, serious harm resulted, and there must be consequences. I want to announce to the campus community that the principal participants in the residence hall room incident have been involuntarily suspended from the college immediately, pending an adjudication of their disciplinary cases. Based on what I heard at the open session and from parents who contacted the college, our students need to know that the people who participated in this event are no longer on the campus. Their disciplinary cases will be conducted under the procedures outlined in the college’s Community Standards and the ultimate consequences could be severe, including dismissal from the college. The process will be supervised by our Vice President of Student Affairs, Dr. Terri Mangione. I am constrained by the federal student privacy laws, FERPA, and by fundamental notions of fairness and due process from providing further specifics about the disciplinary process at this time. While I have full confidence in Public Safety Director Wil Johnson and his team, and while I believe that the investigation has been pursued aggressively, I want to go further to address the concerns of several students and parents who believe that the acts here should be prosecuted as “hate crimes” under applicable federal and state laws. At this moment, we are in the process of retaining an outside investigator to review the results of the Public Safety investigation and to provide us with advice on whether additional steps should be taken with law enforcement agencies with respect to possible hate crimes. The investigator will be experienced in these kinds of investigations and in applicable federal and state laws. The investigator will be given free rein to look at all of the college’s records, videos, summaries of interviews and any other items that he may deem necessary. He will have access to witnesses if necessary. We will be guided by this review and I will communicate the results of the work as soon as they are available to us. Beyond the immediate incident, many themes relating to the racial climate on campus and what the college is doing to address all of it surfaced in the open meeting. I have been in discussions with students in our Afro American Society since last April on precisely these issues. Dr. Mangione is leading our efforts to initiate a campus-wide conversation on race that will address many of these issues. I have charged this group with developing a plan that is comprehensive and sustainable so that the conversation becomes part of the culture of Canisius College. The events of this week only underscore the urgency of the task at hand. I pledge to remain personally involved in these efforts in the days ahead. As so many students stressed in their remarks at yesterday’s open session, this is a time for the Canisius community to take a long and hard look at itself and commit to engaging in conversations and actions that will affirm our dedication to making this a campus where diversity is truly celebrated and valued. And that conversation will reinforce and strengthen and reinforce Canisius’s commitment to welcoming and nurturing students of all colors, beliefs, and backgrounds. Thank you in advance for being part of this critically important initiative.